Here at Queen B HQ we take presents pretty seriously. We want to pick the perfect pressie for each of our loved ones and keep eyes and ears open from at least October for that something special that will push the joy levels over the edge on Christmas morning. As it is the season of giving, we have come up with the ultimate guide to help you find that perfect gift. The gift that will let you reign supreme over the turkey and be in everyone’s good books until at least late January! It isn’t just that this magazine is a boda fide work of art or that the articles are beautifully written or that it is a truly independent rowing magazine that makes a Row360 subscription a stunning present. It is that it will satisfy the rowing-obsessed one in your life for the rest of the year and look uber fancy and posh on their coffee table whilst doing so. You will have to suffer the occasional smugness that comes from being a subscriber and being in the know, but it is totally worth it when you can oh so subtly pinch a copy they have read and smuggle it out to live on your own coffee table….a win/win in our book! There quite literally is no better present for the cox in your life. They will be thrilled, delighted, indebted to you and blown away by how crazy thoughtful this present is. Chattercox was created by Zoe De Toledo and Katie Apfelbaum – two of our favourite people on the planet – to fill the gap for coxes everywhere and provide coxing-specific coaching. Knowing the benefit of having a strong cox as a teammate, Zoe and Katie offer personalised coaching for coxes of all levels. It doesn’t matter what stage you are at, Zoe and Katie are there to take you to the next level. With sessions starting at £30.00 there really is no excuse not to spoil your cox this year and give the gift of world class coaching. Check out their website at www.chattercox.com to read about the services on offer and sign up your cox in time for Christmas!! It is fair to say that here at Queen B Towers we enjoy the girly things in life and when we heard that renowned make-up artist and our favourite YouTube guru Lisa Eldridge had published a book, it shot to the top of our wish list! Face Paint is all about the history of make up and is full of fascinating stories of how and why the items in your make up bag came to be. The images in the book are absolutely stunning and frankly no bookshelf is complete without a copy of Face Paint. An absolute must for the make-up addict in your life! You really can’t go wrong with a quick trip to the Rock the Boat website. 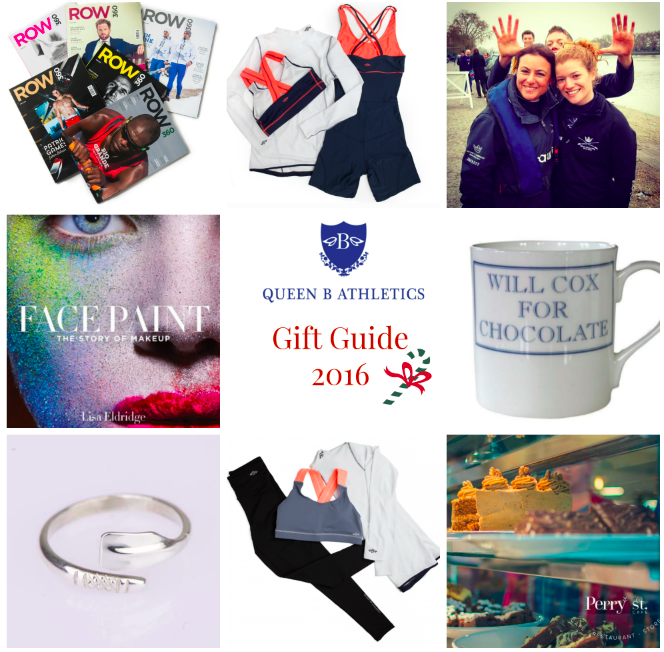 Everything you have ever wanted and more for the rower in your life. From cushions to teatowels, books to cufflinks, t-shirts, carstickers, baby sleepsuits….you will find it all and more at Rock the Boat. With a cracking sense of humour and stunning variety we challenge anyone to walk away empty handed from a visit to our friends at Rock the Boat. When Brid first told me about this one I admit I was sceptical, now several months of drooling over the rings, bracelets and necklaces and I am a total convert! rowingjewelry.com have taken rowing as their inspiration and created something genuinely cool and covet worthy. We are big fans of the oar rings, check out their Instagram page for more pics and then head on over to the website – we will see you there! With so many of our Queen B’s located around the world and Ireland we like to include gifts that are accessible online but we couldn’t go another year without mentioning the crew in Perry Street in our home of Cork. Home being the keyword here. Because Christmas isn’t Christmas to us unless we are 1. Home and 2. Having lunch in Perry Street Cafe. Twinkly lights everywhere, the most beautifully decorated trees and the friendliest team could easily make you forget you’re in for the best lunch/dessert and will need to be rolled home. We will see you soon lads! Can’t wait. Check out their Instagram and try not to book flights to Cork to get your hands on their brownies with a hot chocolate! Well now, it wouldn’t be a gift guide without a shameless plug for our own kit now would it? Come on people, we have targets to meet, so get over and check out the brand new designs and (my personal favourite) the cosy combo of baselayer, allinone and sportsbra – rowing stash perfection for under the Christmas tree. Just don’t forget to tag us in any photos and if anyone needs help with sizing or product selection we are a mere email away. Happy shopping! !